Outdoor grilling recipes or summer recipes are an easy and healthful choice for any occasion; backyard cookouts, camping or picnics in the park. Only prime cuts of meat should be used for bbq recipes when cooked with the direct exposure to intense heat. Tender steaks, chops and cutlets are the first choice which will emerge juicy and tender. As when cooking in your kitchen, less tender cuts can be cooked on the grill using lower temperatures and indirect heat for a longer period of time. Great tenderizing marinades can also be used on these tougher cuts of meat before they are grilled. With the right technique, almost anything can be cooked on a grill. Most people who have favorite outdoor grilling recipes also seem to have a favorite fuel to cook over. The smell of meat grilling over charcoal or any of the many seasoned woods must be the greatest fragrance that could radiate from anyone’s backyard. Some woods like apple and other fruit woods lend their own unique flavor to whatever is on the grill; most hardwoods are very satisfactory. Although I love the flavor of the food cooked over charcoal and wood, I favor a gas grill because it is so easy and convenient; time saving. I want to also extend a few words of safety precautions when doing outside grilling recipes. First is to never allow children or pets near a hot grill; it is easy to forget if running in and out of your house for supplies. Be sure the grill is set on a solid level surface and is set away from shrubbery, grass and overhangs. Never use any other fuel to light charcoal which is not a charcoal lighter. (NEVER USE GASOLINE OR KEROSENE). Never leave your hot grill unattended. This spicy grilled chicken has a delicious flavor. Add a few red pepper flakes to the marinade if you like grilling recipes which are hot! Combine all ingredients in a 2 gallon freezer bag. 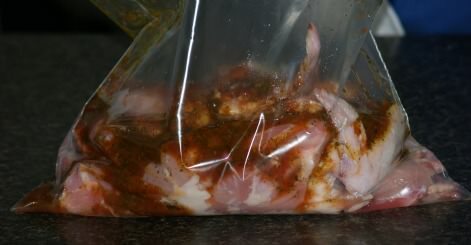 Add the chicken parts in the bag and seal tightly. Toss to coat chicken with mixture. Lay the bag flat on the refrigerator shelf. Turn bag over each hour and refrigerate for 4 to 6 hours. 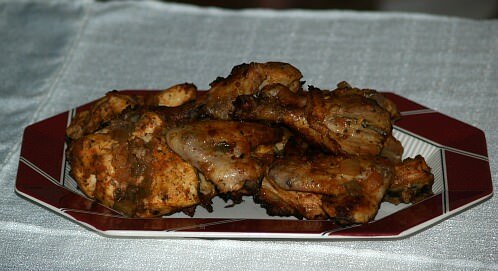 Baste chicken periodically with sauce while cooking on hot coals or gas grill. Cook until chicken is tender and done. Grilling potatoes add a new dimension to cooking potatoes. When grilling recipes in foil like these potatoes, I like to open the foil toward the end and close the grill lid to let the grilling flavor from the fire penetrate the food. Cut potatoes in half. Lay out 8 pieces of foil large enough to wrap potatoes loosely. Spread butter on the tops of each potato half. Sprinkle the salt and pepper on top of butter. Then sprinkle the chives and parsley on top. Wrap the potatoes leaving room for steam expansion. Place on hot grill for about 50 minutes or until the potatoes are tender. Be careful of the steam when opening the foil. Grilling recipes for making kabobs are a favorite to many doing outside cooking. This vegetable kabob recipe goes well with pork, beef, lamb or fish. Place potatoes and onions in a saucepan. Cover with water and bring to a boil. Boil only until potatoes and onions can be pierced with a fork. Remove from heat and drain. Cut onion in quarters. Begin alternating vegetables onto 4 skewers. In a small saucepan, combine butter, lemon pepper and garlic salt. Heat until butter is melted. Place the skewers on a hot grill and brush with butter often while vegetables are cooking. Cook until tender. Grilling salmon is quick and easy. Fresh salmon is always great cooked on the grill. This is one of the very easy grilling recipes that is extra delicious flavored with the Italian dressing and cilantro. Mix dressing, cilantro and pepper in a large freezer bag. Put the salmon fillets in the bag and toss to coat the salmon. Refrigerate the salmon, turning the bag over each hour for four hours. Cook on a moderately hot grill (can use a fish screen on grill) 15 to 20 minutes, turning over once. Who would think to include a Reuben Sandwich recipe in grilling recipes! This one is great and works extremely well for campfire cooking. Cut 4 pieces of heavy duty foil, large enough to wrap 1 sub roll loosely. Cut sub rolls in half lengthwise and lay each on a piece of foil. Lay a piece of cheese on the bottom half of the roll. Put ¼ of the corn beef on top of the cheese slice. Spread drained kraut on top of the corn beef. Spread ¼ cup of the dressing on top of the kraut. Then place another slice of cheese on top, followed by the top of the sub roll. Wrap sub in the foil and place on the heated grill for about 10 minutes or until thoroughly heated.